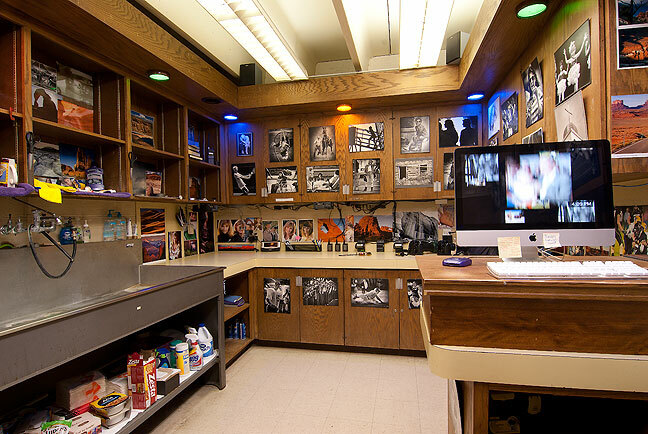 There have been other darkrooms; The Lawton Constitution, Oklahoma University, The Shawnee News-Star, The Daily Times in Ottawa, Il., Color Chrome Photographic Lab in Norman, Oklahoma. This view shows me posing in the tiny two-person darkroom in Shawnee, Oklahoma, circa early 1987. I recently posted an entry about cleaning up an area of workspace at my office, but I didn’t specify why I was doing it. Last fall, the air conditioner in my office died. A service came to repair it, but the repairs didn’t hold, and it would require a new compressor to fix it. It’s a commercial unit, and it can’t be repaired for less than $3500. When we got that news in October, we decided we couldn’t justify the expense, since we have a huge building occupied with just a fraction of the staff it originally held, and that air conditioner only cools my office. 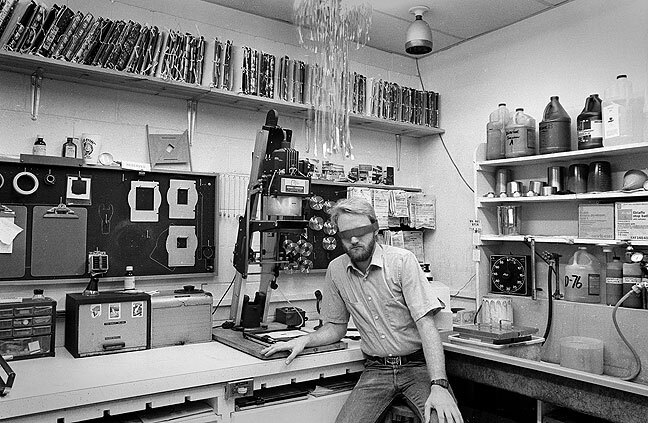 When I first came to Ada in 1988, the entire photography product was film processing and paper printing, so it made sense for the darkroom to remain separate. It wasn’t until 1998 that I got a computer and a film scanner, and in 2005 I got rid of the last film camera, and was all digital. 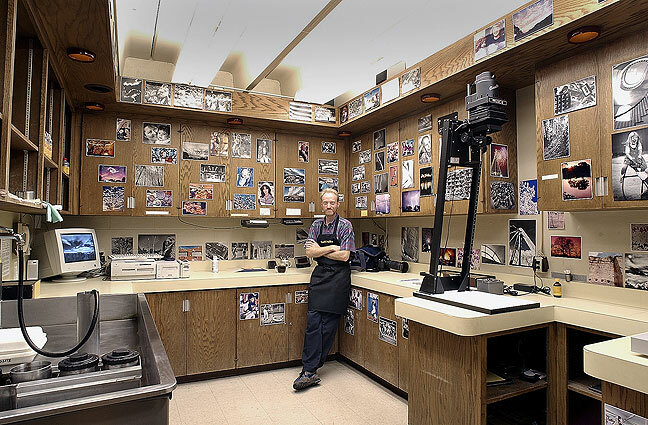 This is my office/darkroom as it appeared in 2001. At that time, I worked with mixed media, from my newly-acquired Nikon D1H to processing and printing Kodak P3200 film. Since October I have weighed my options. I had the air conditioner people survey the situation, and they determined they could not run ductwork from other units on the roof for structural reasons. At that point, it became clear I needed to move before spring. I looked around the whole facility. One possibility was the downstairs darkroom that once housed the process camera and its film and chemistry, then later the image setter and its chemistry. But time and sloppy negligence rendered the walls and floors irreparably (at least to me, with no budget) stained, corroded, and disintegrating. 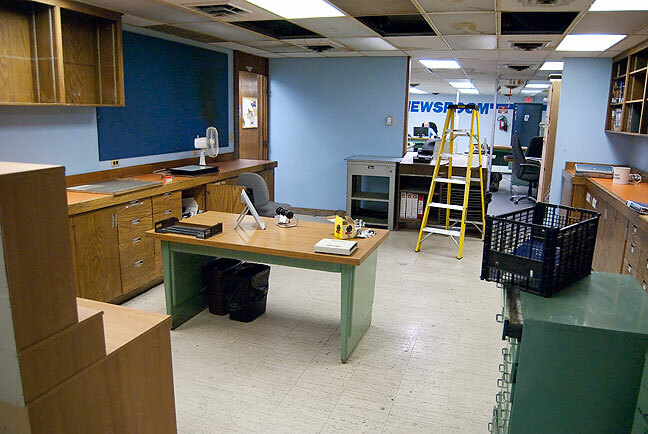 Another possibility was the downstairs office that once housed our production manager; his office remained vacant since his retirement and the removal of our press (The Norman Transcript prints our paper since 2011.) But that office had no storage and no network connections, and was nearly as big a mess as the process darkroom. This is my office, for years the “darkroom,” as it appeared at the end of February 2015, just before I began to move out. When I stopped processing film and printing pictures, I replaced the safelight bulbs with colored compact fluorescents. Think I’m kidding about the crap I dug out of the old composition department? 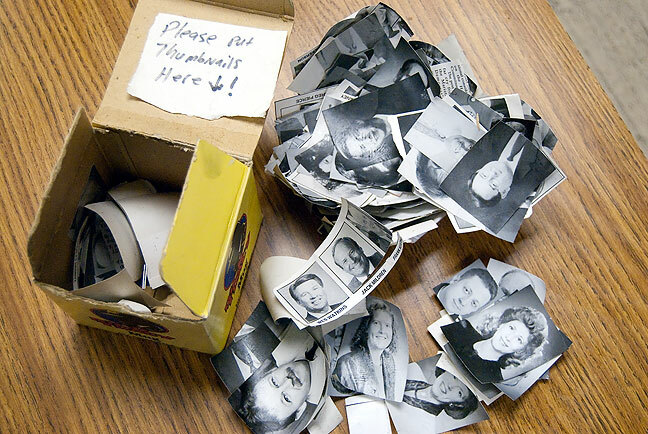 Here is a box of waxy, wadded-up PMTs (Photo Mechanical Transfers) of mug shots. We haven’t used a PMT since 1998. As I searched I got more interested in a large area between the newsroom and the advertising department that once housed the cut-and-paste composition department, often called “paste-up.” I cleaned the area out five or six years ago, but it re-accumulated rat trash as it remained unoccupied. Still, it offered what I needed: storage space, network connections, work space, and some degree of privacy. Starting in mid-February, I began gathering and hauling away stuff that should have been trashed years ago. Three-ring binders with color slides of Oldsmobiles from 1991. Composition pages for “gardening guide” sections from 1987. Amberlith. Border tape. Spent Exacto knife blades. Clip art. Font sheets. 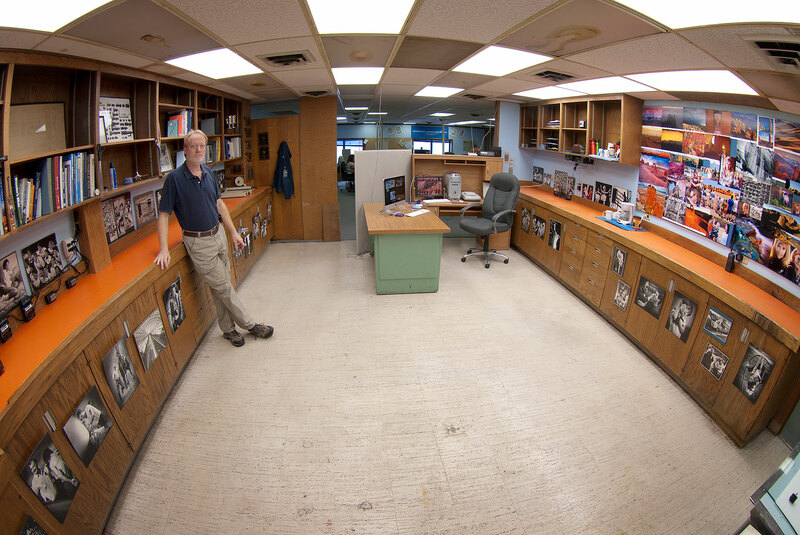 This view shows the old composition department in the middle of cleaning it out to make it my new office. You can see the newsroom through the opening on the right side of the frame. Is it my insecurities talking? When I first started telling co-workers I wanted to move into the old composition department, many of them seemed a little panicked by the idea, and I wonder if it was sympathy for me and the work it would require, or fear and disgust that I would be in their midst. I did all the cleaning in my spare time, and didn’t let it interfere with daily operations. Our publisher had an electrician repair and replace the lighting, and I got some new ceiling tiles to replace missing and damaged ones. In 1991 we had a staff of three in paste-up, almost always college-age girls, since we paid college-age wages. One day just before deadline I was flirting with them when I spotted this mistake, which I peeled off the page and taped into my journal. I sometimes wonder what hilarity would have ensued if I had not caught this typo. This is the remains of my old office. Now that it’s empty, it feels and sounds a little bit like what I imagine a prison cell is like. The more I cleaned the place, the bigger it got. I removed unused and discarded file cabinets, lumber, and shelving. And the place appeared bigger after the lights were fixed and the ceiling tiles were replaced. It was an enormous amount of work, but now that it’s done, I feel very happy about the move. Oh, and I saved the big news for last: my wife Abby is retiring. Her last work day is March 31. Abby worked for PrePaid Legal Services since December 10, 2003. In the summer 0f 2011, it became Legal Shield. In her life she has managed Sonic Restaurants, run her own restaurant, worked as a veterinary technician, worked as an accountant, run a Stuckey’s Restaurant, worked as a fundraising sales person, and, when I met her, sold newspaper advertising. She is so glad to be retiring. 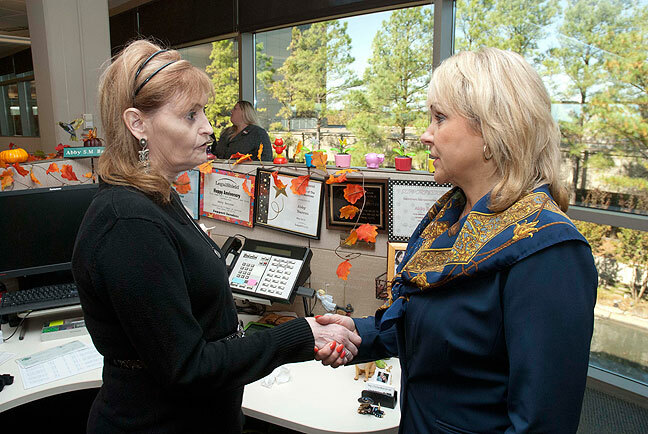 While photographing Oklahoma Governor Mary Fallin, right, at Abby’s workplace last October, I suggested she go down to meet Abby. Congratulations on the move, and on Abby’s impending retirement. I know that has to be a relief for her. And it’s got to be nice for you to know that she’s able to do more of the things she likes as opposed to going to work every day. The new digs look spectacular and I’m surprised, actually, that you didn’t make that move years ago. When I think back on the space, it’s perfect for your needs. Glad to see the tidy little coffee station on the counter. I’ll never forget the old “darkroom,” though. It was always kind of a retreat for me from the main office. Nice fisheye view, by the way. Impressive repurposing. I hate wasted space. Let’s not tell Tracey that you discarded file cabinets, border tape, and font sheets however. He’ll break out into a rash! Looks great!!!! Nice to see the evolution. 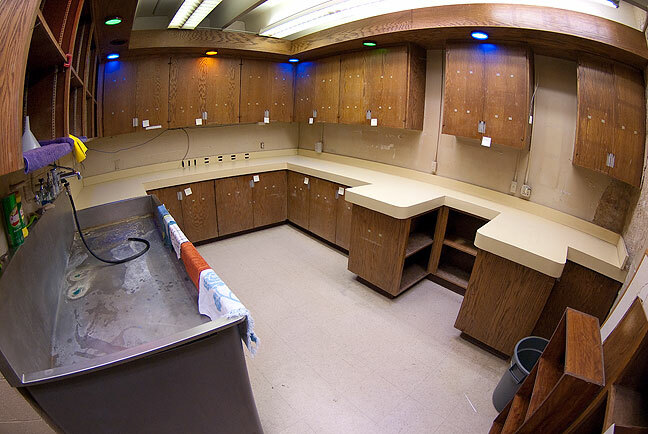 It looks like you also decorated the cabinets with pictures identifying the bodily remains you’re storing there. Nice touch! Looks like a job well done on your new space. I hope you settle in quickly. And congratulations to Abby on her retirement. 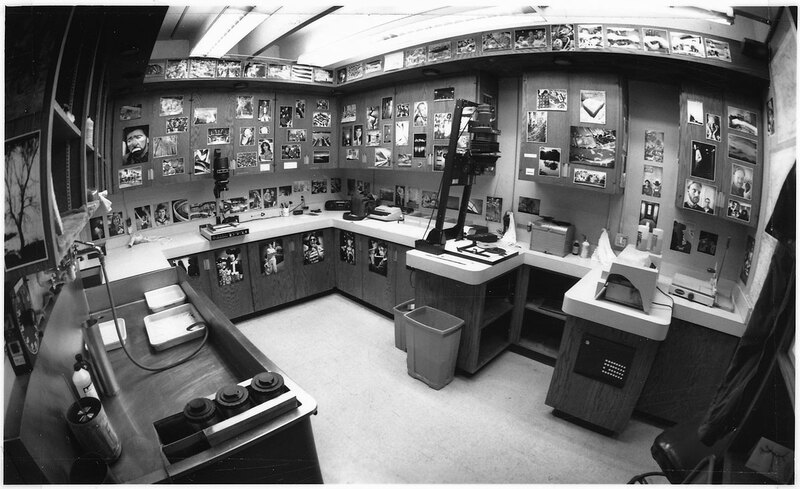 Many awesome memories in that old darkroom. I will miss it while I look forward to seeing the new in person. Now that I am settled in, I find that I have a huge amount of personal workspace, much larger than before. I expect to utilize some of that in the form of some kind of mini-studio arrangement. Congratulations to Abby on her retirement. Your new office is very nice. You said paste up. Is that the same thing as back shop? A prison cell is about 6′ 7′ to 8′ by 14 feet. Everything in a prison cell is concrete and metal. The toilet is stainless steel and comes with a small sink attached to the back of it. The bottom bunk has two drawers underneath it. There’s a built-in desktop along the wall, with a bolted down stool for sitting at the desk. An inmate will often hang a sock across the top of the cell door, to keep the door from locking, so he can get out of the cell if he needs to for some reason. I don’t think that really works though. But inmates believe a lot of erroneous information. Your old office doesn’t look like a prison cell to me, but if you wanted to do so, you could turn it into one. Awesome! I will come visit you in your new digs when I’m able to. Looks great!